It's here, friends! 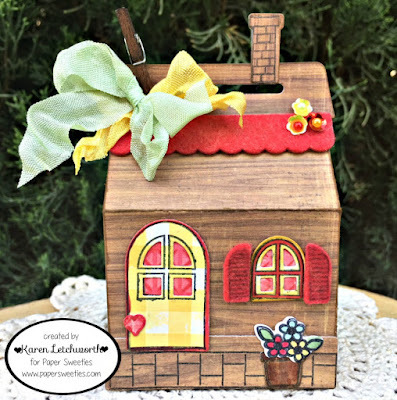 It's the SWEETEST day of the month as Paper Sweeties releases their adorable new sets - Treat Box Home & Garden Add-Ons Stamp Set and coordinating Treat Box Home & Garden Add-Ons Sweet Cuts. They are SO cute, and they work so well with several other Paper Sweeties sets. As I showed yesterday, these sets work well with the Home Is Where Your Story Begins set; and as I'm showing today, it also works great with last month's new Treat Box Sweet Cuts. 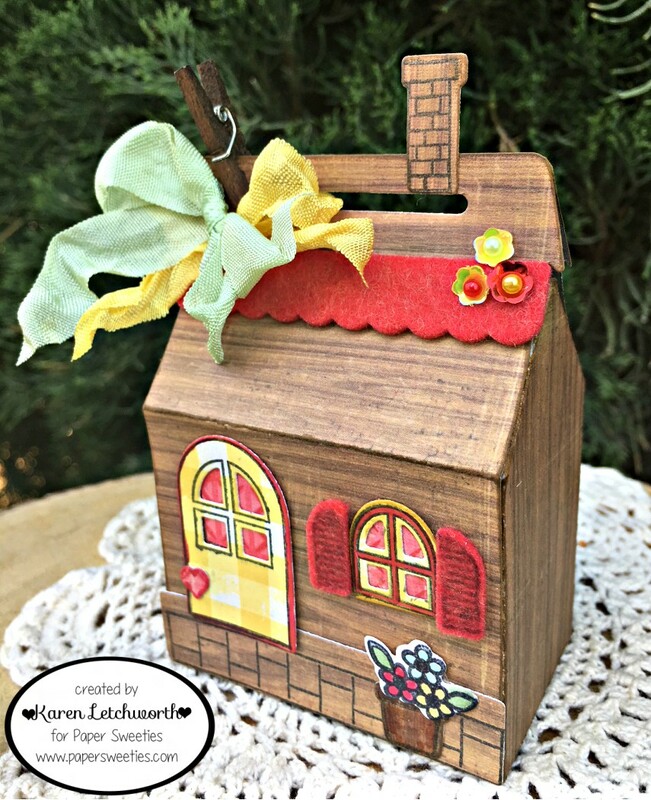 This adorable little treat box can also be turned into a sweet little house, or.....as in this case where it became a wooden "log" cabin. Using the Treat Box Home & Garden Add-Ons Stamp Set and Treat Box Home & Garden Add-Ons-Sweet Cuts, I stamped and cut a sidewalk, the flower pot and flowers, the door (with small heart), the window, and chimney, as well as the awning and shutters which were both cut from wool felt. I attached some Cookie Dough Seam Binding, Mint Seam Binding, and some Cookie Dough Sequins and Strawberry Sequins to the awning. Thanks for stopping by, and I hope to see you again tomorrow. What a sweet house treat box, Karen! Great touch with using the felt! Pretty sequins and ribbon, too! Lovely project!! Your log cabin is so cute! Great idea! Oh Karen what a treasure, so very pretty!